The FSDG – YBAS Ayers Rock scenery is required. The ORBX – YBAS Alice Springs Airport scenery is required. The ORBX – YBCG Gold Coast Airport scenery is required. Urmel’s AFD-Selector is available for this enhanced AFD! The Aerosoft – Anchorage professional scenery is required. The ORBX – PAVD Valdez Airport scenery is required. The flyTAMPA Maarten scenery is required. The flyTAMPA – Corfu scenery is required. The ORBX – LDDU Dubrovnik Airport scenery is required. The JetStream Designs Marseille Provence – LFML Airport scenery is required. The JetStream Designs – Milan Linate Airport scenery is required. The ORBX LOWI Innsbruck Airport scenery is required. The ORBX – KSAN San Diego International Airport scenery is required. The FSDG Heraklion scenery is required. The FSDG Graz scenery is required. The DIGITAL DESIGN – LOWS Salzburg W.A. Mozart P3D4 scenery is required. 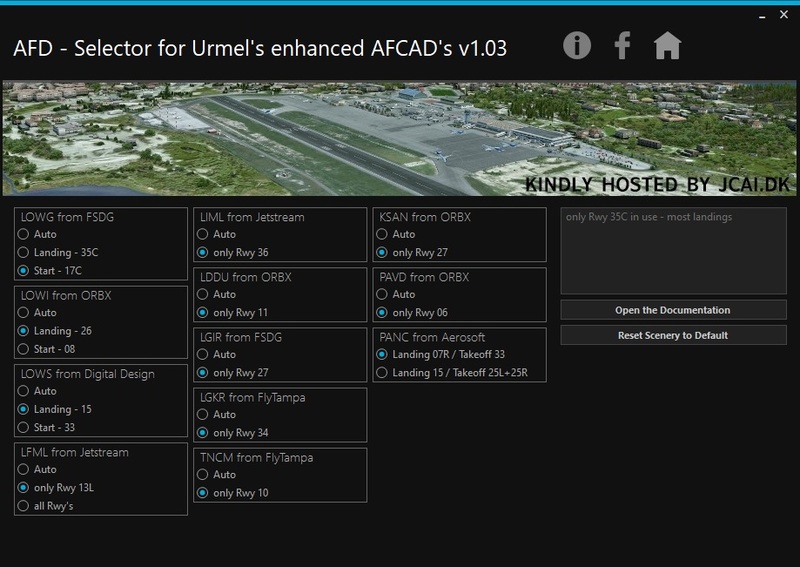 Urmel’s AFD-Selector makes it more easy to switch between different Urmel’s enhanced AFD’s for one Airport. For some Airport’s it is necessary to switch sometimes AFD files, to get them working correctly in Prepar3dv4. Some of my enhanced AFD’s will be available for this AFD-Selector. Many Thanks to the guys from 29Palms, they provided us this great tool for free! The TAXI2GATE – POINTE-À-PITRE LE RAIZET AIRPORT TFFR P3DV3 scenery is required. The ORBX – ESNQ Kiruna Airport (ESNQ, ESSD, ESSV included) scenery is required. The ORBX – ESNQ Kiruna Airport scenery is required.